The theater has been owned and operated by the Tevanians for 45 years, since Tevanian’s father, also named John Tevanian, purchased the theater in 1971. Now the facility is owned and operated by his son, who has worked at the drive-in since he was a kid. In the past 25 years or so, the younger John Tevanian has guided the business through changes in the industry and in its regular customer base. When the younger Tevanian left for college in 1986, he said, “the business was collapsing.” The popularization of home VCRs as well as the rising price of land – which drive-in owners could sell to developers – made it difficult to stay in business. But his family stuck with their business model, Tevanian said, and by the 1990s customers started returning, in part due to the dwindling number of drive-ins around the state. Maine, once home to 37 drive-ins, now has six, according to Tevanian. Tevanian himself returned to the drive-in after finishing college in the early 1990s, thinking he would “stick around for the summer,” he said. He ended up staying, and now runs the place. A few years ago, Tevanian made the decision to convert his projection equipment from 35 millimeter film to digital projection technology, due to pressure from the industry, he said. Film was the industry standard up until about 10 years ago, when the studios started pressing theaters to convert to digital, a cheaper means in terms of production and distribution. One of the theaters that still uses film, said Tevanian, is Pride’s Corner Drive-In on Route 302 in Westbrook, run by his brother, Andrew Tevanian, and their father. When Tevanian converted to digital, he also built a new snack shack, a larger building with more amenities than the original. He had a go-big or go-home mentality, he said. Assistant Manager Annmarie Sargent started working at the Bridgton Drive-In in 2004, “back when we were just a snack shack,” she said. She’s been there through all the changes, and has pictures of the old snack building on her phone to prove it. Sargent, a certified nurse’s assistant also employed at Fryeburg Health Care Center, intended to work at the Drive-In for just one summer. She’s stayed on because “either I’m insane, or (Tevanian) is decent to work for,” she said with a laugh. Another evolution at the drive-in, Tevanian said, is the theater’s core clientele. In the 1970s, the drive-in was a teenage hangout that played horror movies. Now, “kid and family movies are the drive-in’s bread and butter,” he said, for parents who want their kids to have the drive-in experience they enjoyed growing up. Erin Jackson, a Bridgton resident and mother of two, said she likes to go to the drive-in a few times each summer. The nostalgia factor, Jackson said, is in part what makes the drive-in appealing. Jackson recalled her first drive-in experience, seeing “E.T.” as a kid. Kids running in the lot filled with parked cars, eating popcorn on a blanket outdoors and watching a movie from the privacy of your own car are all part of the atmosphere of the drive-in and “what makes it fun,” she said. 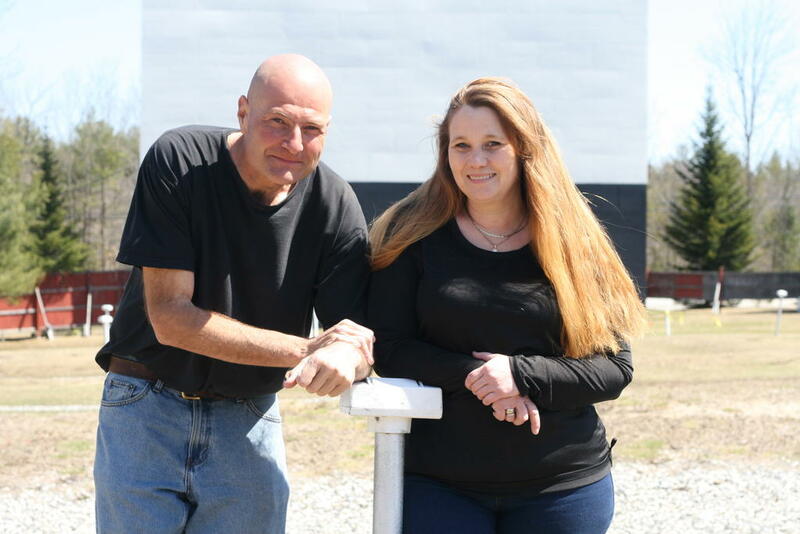 Owner John Tevanian, and Annemarie Sargent, assistant manager at the Bridgton Twin Drive-In Theatre, stand in front of the screen at the theater which re-opened for its 60th season last weekend. From left, John Tevanian, owner, and Annemarie Sargent, assistant manager at the Bridgton Twin Drive-In Theatre, which re-opened for its 60th season last weekend.